I’m pretty stoked to see FOUR 5-star reviews of “A Glimmer of Perspective” on my Amazon site. Three of them were from the Facebook OC Writer’s group, though I’m happy to say I didn’t ask for any of them. All of them were the honest opinions of others. And I don’t even know who the fourth is! So people seem to like my writing. That’s good. I’m happy to hear it. Still, please take a look! Because I’m starting something new! This story is set in the Dreamscape universe. And I’m aiming for it to be a short. I hope. Whenever I actually AIM for a short story, it ends up long. But so far, the pieces are just falling in place without any trouble. So far I’m about 1,000 words in. I don’t really know how long it will be. I have a middle and an ending vaguely in mind, but that’s it. But so far, I’m enjoying it and the characters are just fun. And now to the not-so-fun thing. The stress in my life is getting…extremely difficult. The stress caused by issues at work, Caitlyn’s seizures and everything else are starting to impact every aspect of my life. I’m not sleeping well. I can’t concentrate. My writing isn’t working as well as I want to. I’m not doing well at work. I have a plan on what to do…but…well, I need some serious divine intervention to make it work. Now’s a good time for a miracle, God. I’m taking a break from World of Warcraft right now, even though 5.4 just launched. I wanted to give things some time to settle down before I head to the Timeless Isle…and then take Lyss into Siege of Orgimmar. Should be fun…though now I get the fun activity of trying desperately to hide from spoilers about the end cinematic. So after I finished most of the campaign and Tiny Tina’s Assault on Dragon Keep in Borderlands 2, I decided to move on to something I’ve been wanting to play for a bit: Star Wars: The Old Republic. I haven’t written much about this since I stopped playing back in March some time ago. I feel bad for BioWare, because they had an amazing game there…but…it just didn’t hit the nail like it should have. The original issues that annoyed me greatly in the beginning are still there. Very long load times and very long travel times. I might be spoiled from flying in WoW, but it’s just difficult to judge. In addition, I don’t feel all that powerful. I seem to have to heal after every fight…and it slows things down a lot. Sadly, there are new problems with the Free to Play model. Primarily, they shove the subscription model in your face every chance you get. Seriously…it’s EVERYWHERE. When you go into a rest area, you find out you don’t get rested XP…from a giant message along the time. Just mousing over XP bars or even GETTING QUEST REWARDS…you’re told a thousand times you need to subscribe to get this, that or the other. With that being said, the story is still damn near amazing. At the moment, I’m going through the Jedi Knight quest line on Alderaan and I am definitely into it. I do love that my character is actually fully voiced. And the environment are gorgeous. I’m considering reupping for about a month or so to see if it’s worth it or not. But I haven’t decided yet. So, to end tonight, let’s talk about my own rewards. First of all, I purchased a Fluttershy and a Twilight Sparkle patch for my work bag. And a new pony shirt. (What? Did you think you were going to escape the pony thing? Ha!) I’m totally thrilled to get these. My own little present for finally getting published. Anyway, that’s it for this week. I’m going to put the whole “Journey to Equestria” thing on hold for a bit. I need to update it and proofread it. Go check out “A Glimmer of Perspective” now! This is about our companions. Of the secrets they keep. Of the duties they perform. Of the work they do every day as we rush around in our lives, unaware of the hidden things in our own homes. We can only see the direct result of their labors. But occasionally, our companions will allow us a glimmer into the true nature of the world. This is one such glimmer. 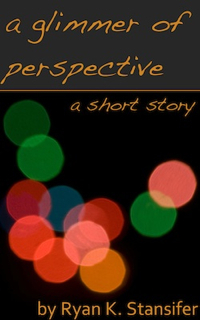 I’m happy to announce that “A Glimmer of Perspective” is now available for sale on Kindle. I’ve edited the story to death, killed myself trying to come up with the right cover and gotten a million opinions, but it’s finally done. I’m currently selling it for just $0.99, so hopefully I’ll do pretty well. The only trick is to get eyes on the story. That’s going to be the serious challenge. However, my Facebook writing group (OC Writers) has been very supportive and two of them were nice enough to actually post very positive reviews. And no, I didn’t ask them to do it. They did it on their own. I’ve had pretty good comments on this story overall. I posted the original draft on deviantArt some years ago. The story is completely different now, but still, those comments helped encourage me to do this in the end. I won’t bore you with them though, at least not right now. Things…aren’t going well for me right now. I’m not foolish enough to be totally honest and open about them. I’m sure I’ve caused serious problems doing that in the past, as I’ve said before. But I’m having a lot of trouble at work. And I’ve had a serious increase in panic attacks lately. I don’t know if it’s about Caitlyn’s MRI tomorrow, dealing with leave issues with work, all the work I’ve put into Glimmer, Caitlyn generally being a bit of a lunatic lately or what. It seems like I’m under attack from all sides right now. I was hoping it would lessen when Glimmer was done, but it hasn’t. If anything, Glimmer was a good distraction for the serious problems I have right now. I can’t say more. But I’ll ask for whatever prayers/good thoughts/what-have-you you’re willing to send my way. *Sigh* I actually tried to do some writing this week, but I got less than 200 words done. Terrible, just terrible. I can’t believe it. All of this stress has sent me into serious issues with my writing. I don’t know what project to work on. Should it be “The Last Dreamer” or should I delve back into the Dreamscape universe? I don’t know…and I won’t be able to decide today. I don’t know…I might just have to write when I can this month. It’s going to be hell with all of Caitlyn’s medical appointments, combined with the OB/GYN appointments for Laura. Plus I’m going to need to see a few doctors this month. I have no idea how I’m going to keep it together. Also, because there’s like maybe 3 of you. But hopefully, I have a few more folks coming in because of this story. Anyway, it’s time for the weekly videos, right? First we have this GORGEOUS song, based off “Love is in Bloom.” I beg you just to try and listen to it. Yes, it is Pony-related, but you need to move past that and just enjoy this stunning music. Now this, this is just fun. I love the visual style of this video. It’s just plain old COOL. I wish I could come up with effects like this. That’s it for this week folks. Next week, I’ll see about posting the “Journey to Equestria” retrospective for something different.